Here we discuss tips on how to clean copper. Proper cleaning produces amazing results immediately. 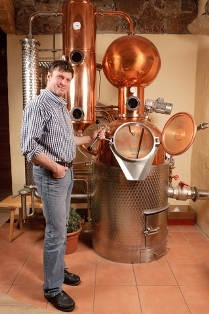 From small antique pots to large beer stills, cleaning and maintaining the fresh copper is quite simple and cost effective. Point One - Before we discuss how to clean copper you must determine if you have real copper. A magnet will not be attracted to pure copper. If the magnet does pull your item it is probably copper clad. This is fine. We prefer professional premade cleaners as they bring consistent results. Having restored many copper items over the years we have had great luck with Last-N-Kleen as we use it on other surfaces to both restore and disinfect the surfaces. We believe in using environmentally friendly products and we also believe in letting the product do the work. This product works quickly with gentle pressure avoiding scratches and buff marks. Watch a brief photo gallery as we show you how to clean copper with before and after images. We would be happy to answer any question you may have by filling out the contact form below. We know you will enjoy the beauty and cleanliness of your restored copper.